In this episode, we complete the frame for the bottom stack of drawers. This one shows you a couple useful techniques with the Festool Domino that help when laying out Dominos mid-field on multiple boards (say, a bookcase), but it happens to be useful here. Also show how to create a simple reference surface where one didn't exist making positioning very easy and quick. I did this build in a way to show how the structure would sag when dry-assembled to better show the torque. Like most demos, didn't go as planned as the structure didn't sag one bit! (Dominos:1 Paul-Marcel:0) That doesn't mean this stack of drawers isn't going to be up against a lot of torque so we discuss how to significantly reinforce the sides. For the curious, you can get BowClamps from www.BowClamp.com. Also, you can read Vic's blog article here. Floating panels get finished and installed, the upper case glued up, drawer fronts flattened, Dominos pinned, and a discussion of the placement of certain top structure members with respect to their function as part of an "integrated drawer webbing". I also fix a boneheaded visual mistake with a quick router trick, but fast as it was, not making the mistake in the first place is still better! You might find the trick useful for other types of surface repairs. 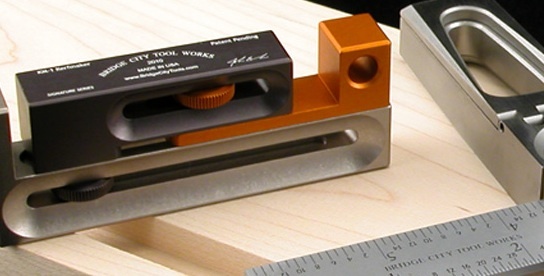 In many of my podcasts, I've used the Bridge City Toolworks KM-1 Kerfmaker to create exactly sized grooves and dados. It can be shrouded in mystery if you are just looking at the catalog. Come to think of it, it can be shrouded in mystery when you are reading the "user's manual". In this video, I'll give you a tour of the KM-1, show how to effectively set the kerf using the actual cutters, and show how to use it in many situations on the tablesaw, router, mitersaw, bandsaw, and even the Bridge City JMP Jointmaker Pro. There'll be a number of demonstrations with close-ups to unveil the shroud! The KM-1 is part of Bridge City's "Essentials". While many commemorative tools are made only once never to be made again, the KM-1 is generally always available. EDIT: at the time I posted this, Bridge City was regrettably out of the KM-1s. I just got confirmation from Bridge City that they will be back in stock in 6-8 weeks. That puts them as available around the last week of July 2011/early August. Put yourself on the list to get one when they are available. Worth the wait. I waited much longer as I got in on the first run! I recently upgraded to a Laguna Tools Italian-Made LT-18 bandsaw. I've used it a lot since recording this multi-part review and like it even more now. At the time of the recording, I had used it for a couple weeks. Part 1 is a tour of the saw itself. The "Italian-Made" is important as this saw is completely different from the LT-18 3000 series also from Laguna Tools. This tour isn't a point-by-point comparison though a couple key points are compared to show just how different they are. The tour also covers the DriftMaster fence. Part 2 gives a tour of the Laguna Tools Ceramic Guides and shows an easy way to calibrate them. On various forums I've seen people say they like the guides but find them finicky to adjust. This method is very fast for me and I'll explain a couple key things to watch out for. The Laguna Ceramic Guides were a key feature for me in a bandsaw. That meant buying a Laguna bandsaw or one where the Laguna guides could be retrofitted. Part 3 shows how to set the drift angle on the DriftMaster fence then does a number of resawing demos to show how consistently thin you can rip stock. You'll get to see how clean and consistent the Resaw King blade and Laguna Guides can make a cut.